This week has been particularly bad for those involved in the Kodi addon scene. Following cease-and-desist notices from the MPA-led anti-piracy coalition Alliance for Creativity and Entertainment, several addon developers and repositories shut down. With Columbia, Disney, Paramount, Twentieth Century Fox, Universal, Warner, Netflix, Amazon and Sky TV all lined up for war, the third-party developers had little choice but to quit. One of those affected was the leader of the hugely popular Ares Project, which quietly disappeared mid-week. 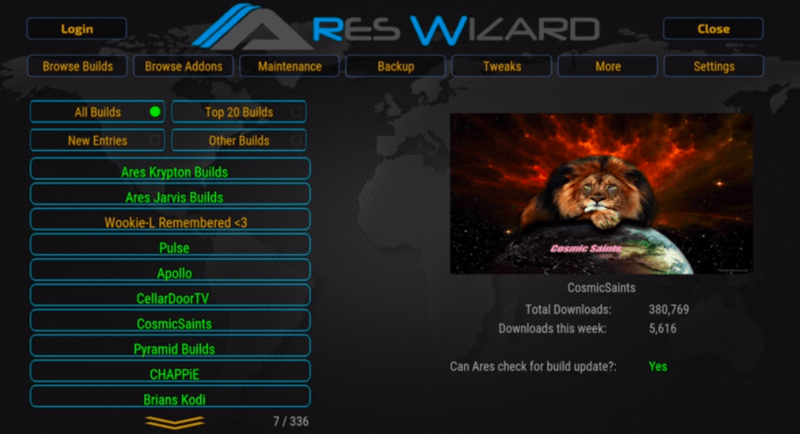 The Ares Wizard was an extremely popular and important piece of software which allowed people to switch Kodi builds, install third-party addons, install popular repositories, change system settings, and carry out backups. It’s installed on huge numbers of machines worldwide but it will soon fall into disrepair. “[This week] I was subject to a hand-delivered notice to cease-and-desist from MPA & ACE,” Ares Project leader Tekto informs TorrentFreak. The news that Ares Project is done and never coming back will be a huge blow to the community. The project just celebrated its second birthday and has grown exponentially since it first arrived on the scene. “Ares Project started in Oct 2015. Originally it was to be a tool to setup up the video cache on Kodi correctly. However, many ideas were thrown into the pot and it became a wee bit more; such as a wizard to install community provided builds, common addons and few other tweaks and options,” Tekto says. “For my own part I started blogging earlier that year as part of a longer-term goal to be self-funding. I always disliked seeing begging bowls out to support ‘server’ costs, many of which were cheap £5-10 per month servers that were used to gain £100s in donations. Intrigued by this first wave of actions by ACE in Europe, TorrentFreak asked for a copy of the MPA/ACE cease-and-desist notice but unfortunately, Tekto flat-out refused. All he would tell us is that he’d agreed not to give out any copies or screenshots and that he was adhering to that 100%. That only leaves speculation as to what grounds the MPA/ACE cited for closing the project but to be fair, it doesn’t take much thought to find a direct comparison. Earlier this year, in the BREIN v Filmspeler case, the European Court of Justice (ECJ) ruled that selling “fully-loaded” Kodi boxes amounted to illegally communicating copyrighted content to the public. With that in mind, it doesn’t take much of a leap to see how this ruling could also apply to someone distributing “fully-loaded” Kodi software builds or addons via a website. It had previously been considered a legal gray area, of course, and it was in that space that the Ares team believed it operated. After all, it took ECJ clarification for local courts in the Netherlands to be satisfied with the legal position. “There was never any question that what we were doing was illegal. We didn’t and never have hosted any content, we always prevented discussions about illegal paid services, and never sold any devices, pre-loaded or otherwise. That used to be enough to occupy the ‘gray’ area which meant we were safe to develop our applications. That changed in 2017 as we were to discover,” Tekto notes. Up until this week and apparently oblivious to how the earlier ECJ ruling might affect their operation, things had been going extremely well for Ares. In mid-2016, the group moved to its own support forum that attracted 100,000 signed-up members and 300,000 visitors every month. “This was quite an achievement in terms of viral marketing but ultimately this would become part of our downfall,” Tekto says. While Ares and Tekto still didn’t believe they were doing anything illegal (addons were linked, not hosted) it is now pretty clear to them that the previous gray area has been well and truly closed, at least as far as the MPA/ACE alliance is concerned. And with that in mind, the show is over. Done. Finished. “We are not criminals or malicious hackers, we weren’t even careful about hiding our identities. You couldn’t meet a more ordinary bunch of folks in truth,” he says. Finally, Tekto says that others like him might want to consider their positions carefully, before they too get a knock at the door. In the meantime, he gives thanks to the project’s supporters, who have remained loyal over the past two years. “It just leaves me to thank our users for their support and step away from the Kodi scene,” he concludes.